Who does LOLER apply to? Employers who have responsibility for the health and safety of their staff as well as the condition of the equipment that they use. The self employed also have responsibilities for themselves and for others depending on the nature of their role. Anyone who hires or loans equipment has a responsibility for ensuring that the equipment is regularly examined by a competent person. Lifting Operations and Lifting Equipment Regulations 1998. Its aim is to reduce Health and Safety Risks to people using lifting equipment. It follows the 1994 Manual Handling Regulations which encourage people to use Lifting equipment. LOLER has been prepared by the Health and Safety Executive for the Health and Safety Commission. LOLER has been made Law under the Health and Safety at Work Act 1974 and it builds on the requirements to provide equipment under PUWER 1998. PUWER 1998 stands for, PROVISION AND USE OF WORK EQUIPMENT REGULATIONS 1998. Basically, it requires that equipment provided for use at work must be suitable for it’s intended use. The regulations also require that all equipment must be safe for use and maintained in a safe condition. That is also a basis for LOLER. The regulation aims to ensure that the equipment is only to be used by persons who have had appropriate training and have access to information such as user guides. PUWER also requires that the equipment must be accompanied by suitable safety measures such as protective devices, markings or warnings. This is also a requirement of the British and European standards for Hoists and forms a part of the essential requirements of the Medical Device Directive. LOLER requires that lifting equipment is strong and stable enough for it’s intended use and that it is marked with it’s maximum load. Again, this is also a requirement of the British and European Hoist standard, BS EN 10535. The regulations require that the equipment is positioned and installed in such a way as to minimise the risk to operators, users and patients. A further requirement is that the equipment must be used safely and that the entire lifting operation must be planned, organised and performed by competent people. The equipment should be the subject of ongoing thorough examination by competent people. Equipment must be examined before it is put into service for the first time, unless it is supplied assembled and ready for use, has not been used at another location and has a declaration of conformity. If safety depends upon the installation conditions, then the hoist should be inspected after installation is complete and before it is put into service for the first time. If the equipment has been moved, it should be inspected after assembly and before it is put into service in it’s new location. Note this does not apply to different areas of the same site. In the specific case of devices for lifting of people, the product should be examined by a competent person at least every 6 months, or in accordance with an inspection scheme drawn up by a competent person who has considered the environment in which the unit is used, frequency of use, loading etc. Note that the inspection includes all accessories such as slings. 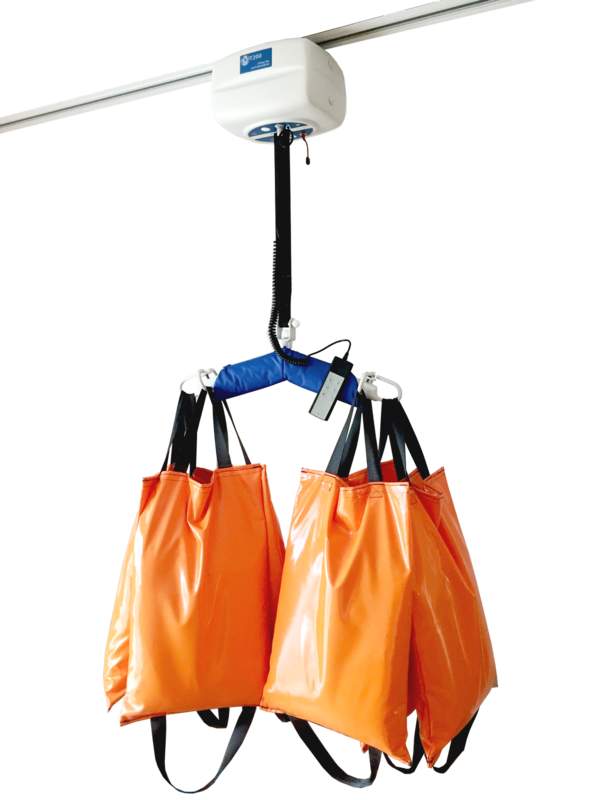 Also, the standard for Hoists for the transfer of disabled persons, BS EN 10535 states that the hoist should be load tested to it’s maximum load at least every 6 months. It is also the employers responsibility to ensure that a competent person carries out the servicing. They must also keep records of the examinations and service reports for inspection by the HSE if an accident ever did occur.